“How many tools are we using right now”, asked Ashima, Head of Business Development @ Vaizle. “Two or three, maybe”, I responded. And then we started counting. Hootsuite. One. Slack. Two. Get Response. Three. HubSpot Sales. Four. Air Table. Five. Yes, five! “No, not five. Gsuite. Google Analytics. Google Webmaster Tools. Google Drive. 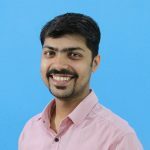 Google Tag Manager” Nitin, CEO @ Vaizle, joined in. I guess the total count has reached nine by now. But wait a minute! 9 tools! And I haven’t counted others which I feel are indispensable—Hotjar, HubSpot CRM. When I reflected, it was a revelation. We’re a team of seven and we’re using over 9 tools. More than one per person. 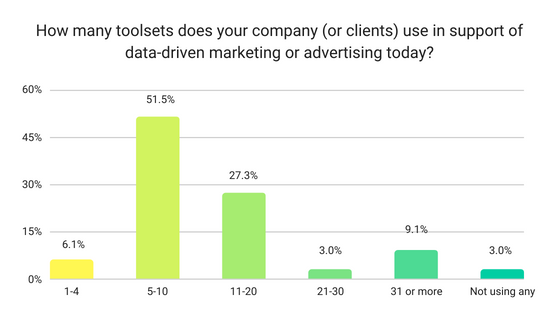 According to a data from Winterberry Group, marketers are using 12 tools on an average! Now look at this: how difficult it must be to filter, select, implement, and then integrate all those tools? Heck, even searching for the right tool is a big deal! I know because I have done that for over five years now. That’s when I decided to compile a list of all the tools for marketers. I am sure this will save you tons of hours while creating your marketing tools stack. Also overlapping into social media automation tools, they help you manage your social media pages and profiles. Along with it, it also helps you engage with your audience without having to access each profile individually. These tools lots of time when you have to manage tens and hundreds of profile especially in agencies. With social media management tools, you can not only have all profiles in a single place, but also schedule your posts for days and weeks ahead. Hootsuite: Used by over 16 million users in over 175 countries, Hootsuite is the most popular social media management tool. If you have no more than three profiles to manage, it is absolutely free! Buffer: With better UI, all your social accounts are in a single dashboard. Starts from $15 per month. Free for up to 3 social profiles. But you can only schedule 10 posts. Sprout Social: A complete social media tool. You will find it in other sections too. Starts from $99 per user/month. CoSchedule: If you manage social media in a calendar style, there’s no tool better than CoSchedule. Starts from $0 for individuals and $79 per month for businesses and agencies. AgoraPulse: It can almost be called the most affordable social media management tool. Starts from $49 per month. Zoho Social: A powerful social media tools which can be integrated with myriad of other tools in Zoho suite. MeetEdgar: A social media management tool that can be almost called ‘cute’. You’ll have fun using it and save lots of time. Costs $49 per month for 25 social media accounts. Doesn’t offer Instagram and Pinterest yet. Sendible: From perspective of an agency, Sendible is an amazing social media tool. Starts from $29 per month. How to track and improve your social media performance? Or check how you compare against your competitors? Social media analytics tools help you do that. You can gather data from your social media pages and your competitor’s and analyse them to gather insights. Vaizle: Social media competitive analysis and benchmarking with actionable insights. Real-time report builder. Starts at $6.9 per month. Socialbakers: A complete AI powered social media marketing suite. Monitoring, community management, content intelligence, audience & personas, and social media management. Starts from $100 per month for five profiles. Quintly: Social media competitive analysis and benchmarking tool. Starts from $100 per month. Rival IQ: Social media competitive analysis tool for improving social performance. Starts from $199 per month. Talkwalker: Complete social media intelligence platform available with web analytics and image recognition. Starts from $8,400 a year. SimplyMeasured: Covers all steps of a social media funnel. (Acquired by Sprout Social) Pricing available at request. Unmetric: AI powered social media analytics platform. Delivers insights and help create compelling content with competitive analysis. Analytics starts from $1,000 per month. Fanpage Karma: Comes with analytics, monitoring, engaging, and publishing tools. Analytics starts from $69.90 per month. Helps track brand mentions across the social media channels, monitor keywords, and keep an eye on competitor’s activity. These tools track activity across the social media channels (sometimes even the internet). It then reports it to social media marketer who can respond timely. Using these tools, social media marketers can connect and engage users quickly. Falcon.io: Unified social media monitoring and automation tool that integrates with CRM. Starts from $29 per month. Brand24: Get instant access to online mentions, grow customer satisfaction, and sales. Also helps with sentiment analysis and influencer score. Starts from $49 per month. Komfo: Social listening tool developed to manage social media relationships with customers. Starts from €1,000 per month. Keyhole: Tracks hashtags, accounts, keyword, mentions, and even URLs. Starts from $199 per month. Mention: Monitor your mentions and your competitors mention in real-time across web and social media. Brandwatch: Get instant access to customer conversations from every corner of the public web, as they happen. Help send mass emails, nurture leads, and build rapport with the people in your email lists. Email marketing tools also come with analytics which help you how many people opened or click on the links the email. MailChimp: Probably the most popular email marketing tool. Starts from $0 which includes up to 2,000 subscribers and 12,000 emails per month. Get Response: A complete marketing tool with emails, workflows, CRM, and even webinars. Starts from $15 per month. Zoho Campaigns: Email marketing tool from Zoho’s business suite. Starts from $0 from 2,000 subscribers and up to 12,000 emails per month. Active Campaign: A complete marketing tool. Email marketing + marketing automation + sales + CRM + messaging. Starts from $29 per month. Aweber: Simple, personalized email marketing, and automation. Starts from $19 per month for up to 500 subscribers. Drip: Everything from integrations and intuitive workflows to personalization and analytics. Starts from $0 for up to 100 contacts. Send Grid: Starts from $0 which includes all major marketing features especially A/B testing segmentation, and email API features. Emma: Used by over 50,000 teams. Powerful email marketing with a personal touch. Starts from $89 per month for up to 10,00 contacts. Convert Kit: Email marketing tool for creators. Starts at $29 per month for up to 1,000 subscribers per month. Also called paid ad tools, they help marketers manage their ad budgets across digital advertising mediums. You can plan, execute and measure the performance of your campaigns. As your budget and the number of advertising mediums increase, it becomes increasingly difficult to track progress. That’s where programmatic advertising tools come to rescue. Wordstream: Advertising tools to maximize performance on Facebook Adverts, Google Ads, Instagram, and Bing Ads. DoubleClick by Google: Integrated insights for every programmatic advertising channel. Tools available to take action in real-time. Adroll: Retargeting platform covering display ads and social media ads. Powered by trademark technology BidIQTM. Perfect Audience: A complete retargeting solution for mobile, cross-device, social, and display channels. You can try it for free. AdEspresso by Hootsuite: Ad management tool for Facebook Adverts and Google Ads. Starting from $49/month. Outbrain: Pioneer in native advertising with the world’s largest content marketplace. Adstage: Closed-loop reporting and automation software for paid media campaigns. Starting from $1,048/month. Indispensable to any marketing/sales team, CRMs help companies manage their contacts and customers at a single place. It helps managers and marketing heads to keep track of the marketing and sales performance. Most of the CRMs now come with marketing automation integrated. So you can create marketing workflows, assign lead score, and track your leads activity on the website. Hubspot CRM: A free CRM for small businesses which can be powered with all-in-one inbound marketing software. Nimble: Smart CRM for Office 365 and G Suite. Starting from $12/month per user. Agile CRM: Sales Enablement + Marketing Automation + Customer Service. Integrations available. Free for up to 10 users and 50,000 contacts. Bitrix24: Free CRM, for up to 12 users, with loads of features. Capsule: A sales organization and collaboration CRM. Free for up to 2 users and 250 contacts. Designing used to be so time-consuming for marketing teams. They had to rely on designers and which would often take several to-and-fro of specifications & iterations to reach a final product. These tools empower marketing teams to create marketing content quickly without having to go to designers. Such tools also allow you to add animations, effects, visual branding, CTAs, and even host the video. Animoto: Video maker for businesses. Starting from $8/month. Canva: Design tools to help you create graphics—yourself—for social media, ebooks, emails, infographic, data presentation, flyers, and much more. Infogram: Create infographics, maps, and reports. Free plan available. Venngage: Tell your stories and present your data with infographics. Piktochart: Create infographics, presentations, reports, posters and flyers. Starting from $12.5/month. Vyond: Create rich media to increase engagement, retention, motivation, and conversion. Starting from $39/month. Wideo: Create animated videos and presentations. Starting from $59/month. Landing page tools help marketers create landing pages without having to go to developers. They come with simple drag-and-drop interface and loads of templates. Also, they help you capture leads and perform A/B testing. Instapage: Own your post-click experience and maximize your conversion rates. Starting from $79. 40+ integrations available. Leadpages: Create lead generation campaigns with high-converting landing pages. 160+ ready-to-use mobile responsive templates available. Pricing starting from $37/month. Unbounce: Create custom landing pages, website popups and sticky bars. Starting from $99/month. Landing Lion: Create landing pages with simple drag-and-drop builder. Free forever plan available. Integrations available. Clickfunnels: The most popular landing page builder where you can build marketing funnels step-by-step. Landingi: Create and optimize your own custom landing pages. Optimizations, workflow automation, and integrations. Starting from $39/month. Lander: Build landing pages in few minutes with 100+ ready-made templates. Starting from $49/month. Customer advocacy marketing is not just a trend but a need. A customer is more likely to buy because someone they know recommended it. Influencer marketing tools allow you to find those recommenders. You can find potential key influencers, rate them, connect with them, and enable them to promote your brand. BuzzSumo: Find, analyse, and outreach influencers. BuzzStream: Research influencers, manage your relationships, and conduct personal outreach. Starting from $24/month for 2 users. Julius: End-to-end influencer marketing solution. Influencer insights and hand-curated data. GroupHigh: Find blogs and social influencers who can promote your product. Traackr: One system-of-record for influencer discovery, management and analytics. Markerly: Connect with real people to get authentic brand affiliations. Webfluential: Collaborate with influencers to build your brand. Starting from $100 per month. Ninja outreach: Get instant access to 25 million bloggers & social media influencers. Find Instagram and Twitter influencers. Starting from $69/month. Izea: Influencer marketing software to find influencers. Collaborate with content creators. Track campaigns and manage payments. FameBit by YouTube: YouTube influencer marketing platform. Self-service available for creators and brands. The oldest digital marketing method cannot be imagined without the help of a tool. SEO tools are wide in its application—competitor research, keyword research, web crawler, backlink checker, rank checker, and much more. They also provide you insights about ranking for specific keyword and web pages. These insights in-turn points to areas of improvement and optimizations. Alexa: Keyword analysis, competitive research, and website ranking. Starting from $99/month. Moz: An all-in-one SEO toolset to boost your search engine rankings. Starting from $99/month. SEMrush: Marketing toolkit for competitors research and organic keyword research. Starting from $99.95/month. Ahrefs: Competitor research tools & SEO backlink checker. Starting from $99/month. Screaming Frog: SEO spider tool and web crawler. Desktop software available for free. Google Webmaster Tools: Track your site’s search performance with Google Search Console. Available for free. For you’re a copy writer, or if your team has one, it’s advisable to take assistance in copywriting tools. They help you craft compelling sentences, fix grammar errors, check for plagiarism, and make your sentences short and concise. Not to mention the time it saves you in creating first draft, editing, iteration, and proofreading. Hemingway App: Helps you write bold, clear, concise, and readable sentences. Available as desktop app. Headline Analyzer by Coshedule: Write headlines that drive traffic, shares, and search results. Email Subject Line Tester: Write email subject lines that drive more opens, more clicks, and more conversions. Social Message Optimizer: Create powerful social messages that convert. Grammarly: Free writing assistant. Fixes errors and checks plagiarism. Google Chrome and MS Office plugin available. More and more companies are conducting webinars to educate their customers. And to conduct one, you need a tool that sets up a webinar, send invites, capture registrations, and host a live or recorded webinar. They also come with reporting where you can check who attended, total attendance, average stay time, and countries from where people attended. Livestorm: Webinar software for product demos, customer training, online courses, live Q&As, live events and much more. Starting from $109/month. ReadyTalk Webinar: Connect with customers, generate leads, show product demos, and train employees. Starting from $119 per month per host (paid annually). ClickMeeting: Run custom-branded webinars to convert, reach, educate, and engage your audience. Starts from $30/month for up to 25 attendees. Zoom Webinar: Full-featured, easy sharing, and scalable. Starting from $54.99/month for up to 100 attendees. JetWebinar: Host no-delay live and simulated live webinars. Starting from $79/month. From use case perspective, it helps you tell your CEO, or your client, the RoI of your marketing efforts. Google Analytics: Free tools to analyze data for your business in one place and get deeper understanding of your customers. SimilarWeb: Website traffic statistic and marketing intelligence. Starting from $499/month billed annually. Hotjar: Heatmaps, visitor recordings, conversion funnels, form analytics, and feedback polls all in one place. Free plan available for personal projects for up to 2,000 page views per day. Crazy Egg: Visualize where your visitors click. Mouseflow: see visitors’ behavior and fix pain points with session replay, heatmaps, funnels, form analytics, and feedback campaigns. Starting from $29/month. Free forever plan available. Open Web Analytics: Open source web analytics software to track and analyse your websites and apps. Woopra: Full-funnel attribution, onboarding optimization, feature usage trends, subscription growth, cohort analysis and more. Free plan available. Heap: Capture every user interaction from web, mobile, and cloud services: clicks, submits, transactions, emails, and much more. Free plan available. Clicktale: Web, app, and mobile analytics for enterprise. Companies need more and more marketing fuel—content. And that too, consistently. These tools help you plan your content, create, manage, and distribute once you are ready to promote. Additionally, they also allow you to benchmark quality content and track your content’s performance. DivvyHQ: A content planning and workflow tool for high-volume teams. Starting from $30/month per user. GatherContent: Produce content that meets audience needs and achieves your business goals — at scale Starting from $99/month. Mintent: Content marketing platform with marketing automation. Free plan available. NewsCred: Enterprise content marketing platform. Percolate: Streamline content workflows and collaborate. Curata: Content marketing platform and content curation software. So which ones did I miss? Uff! It took me hours to compile this list. Hope it will save you lots of time when you start building your tool stack. But I am very sure I missed many names. If you’re using one, or are a founder of one, just write it down in the comments below and I will add it in the list.